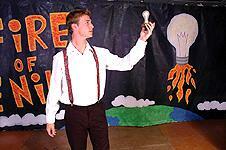 Free Children's Theatre Drama Resources: News, Reviews, Testimonials. 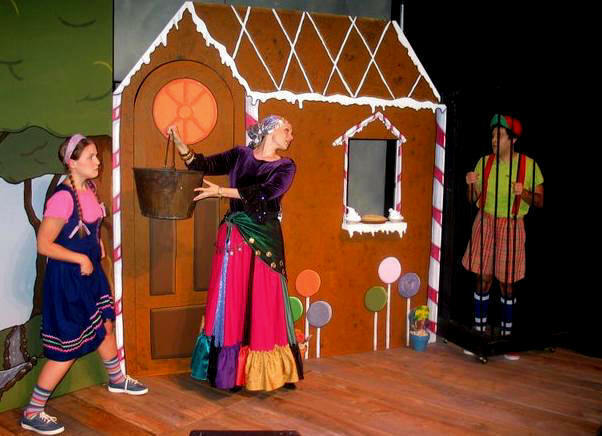 ArtReach offers Award-Winning Children's Scripts and Plays for Schools, Families and Young Audiences. Read free script samples, hear sound cues, see cast lists, get tips and suggestion on producing you play or musical. 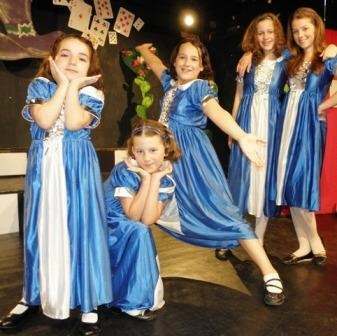 "One hundred sixty students took part in their first theatrical experience; one played the Wizard of Oz." Middlebury, CT - One hundred sixty students that attend Middlebury Elementary School are clearly loved a lot by others. 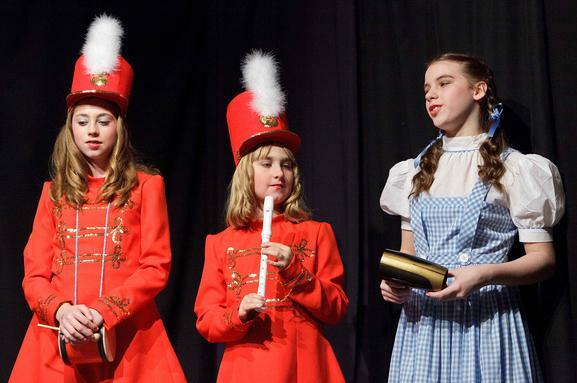 With great joy, they presented a lovely production of 'The Wizard of Oz' on the stage of Memorial Middle School on Thursday evening with the help of many parents and staff members of their school. 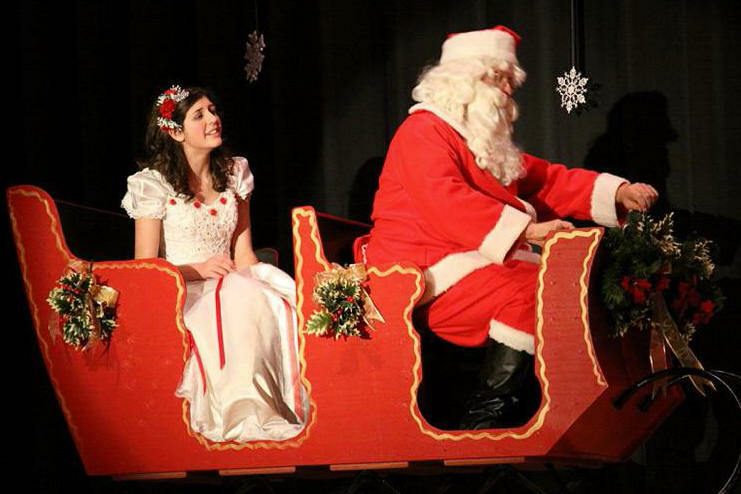 Only one performance remains on Friday evening at 7pm and admission is one item for the Middlebury Food Bank. Director MaryLou Torre, the interim principal of Middlebury Elementary School, understands the importance of theatre in our schools. "The project was all about process. The rehearsals and practices were as much as a part of the experience as the performance you will see tonight. Fun and freedom of expression for the students and the directors were key goals along this journey." "Fun and Freedom of Expression"
This version of the classic book by L. Frank Baum is a play adapted by Kathryn Schultz Miller. It included a huge chorus of "vivacious" students in a rainbow of t-shirts that narrated the story with choral reading from the bleachers house left. 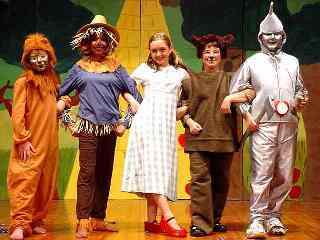 The cast included six different girls in the role of Dorothy, four different Scarecrows, two Tin Man characters, two Lions, two Gatekeepers and many, many others. Everyone had their own wonderful costume; kudos to Amy Raefski on her adorable design work and to the large costume crew. Corinna Flanagan and Kathy Miller served as the Art Director/Set Design team. 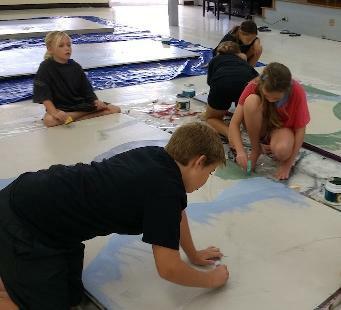 The panels of the set were painted by a large group of students (shout out to Nick Salvucci) that got to wear cool painted t-shirts on opening night. 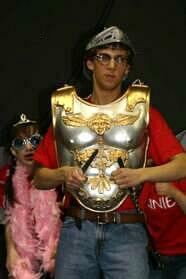 Michael Kaulins served as AD and Lydia McCarthy did the choreography. Chris Turecek was the Music Director/Tech Director. Community theatre actor/dad Ian Diedrich did the prop construction, including the head of the wizard painted on a white curtain; shout out to Kalman Zold who played Oz. Michaela Turecek did the pretty impressive make-up for the actors that needed an unnatural face color. I had a great reserved seat in the front row, but the sound with microphones on stands was really very good throughout the gym. A bunch of young male actors was the pretty adorable Flying Monkeys with Luke Humphrey as Chimp, Emma Taglialatella as Scamp and Kyleigh Favale as Rascal. Eva Guerrera rocked the role of the "they don't call me wicked for nothing" Witch and melted impressively. Addison Mitchell and Owen Lattanzio did well with the shared role of the Gatekeepers. Ryan Dawes and Madison Ferguson were both good Lions and Cole Hughes and Luke Jackson in full silver were effective Tin Man, I mean Men. Scarecrows were Matteo DelBuono, Caitlin Flaherty, Peter Skabardonis, and Kiera Daweese. "They don't call me wicked for nothing..."
Glinda in the classic pink dress and crown was played well by Rachel Anderson, accompanied by bubbles. Featured Munchkins included Ryan Murray (Joe,) Emily Raefski (Curly,) and Hunter Diedrich returned to the stage to play Burly. 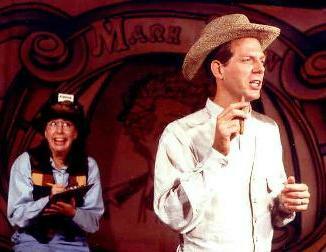 Leah Wasserstein was Auntie Em and Jack Sedensky was Uncle Henry. 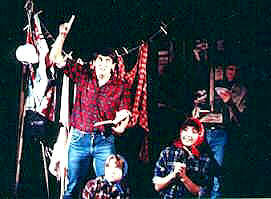 Joey Bernardi barked well in the role of Toto because there was no stuffed dog in a basket in this play. The poppy scene gave new meaning to "pulling my leg" in a cute way. The gaggle of girls in the blue and white gingham included Emma Kulla, Faith Graziano, Lauren Anderson, Grace Jackson, Elizabeth Raefski and Aubrey Guiditta. The most adorable Munchkins specialized in stealing hearts in their floral hats and technicolor outfits. Best featured ensemble was billed as "The Forest" and included Brailee Batista, Evan Deschaine, Lilyana Reed and Shaelyn Walsh as the apple-throwing trees with lots of attitude. The curtain closed between the scenes and if the transitions were a bit long, what the audience saw when they reopened was worth the wait. The students could never be heard backstage and that can be hard for the very young. 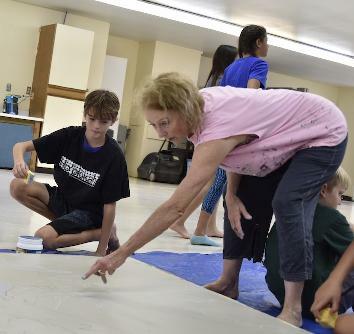 The director shared during her curtain speech that the young thespians, some as young as six, had been practicing since January, during which time their "little school play" grew into a full 55-minute production. The students all knew their lines and if they hadn't expected to perform in front of people sitting in the 600 seats, it did not show. Thank you to this elementary school staff for giving most of these young performers their first theatrical experience in a safe setting. Congratulations on a job well done. "Just the right mix of comedy, suspense and thrill." 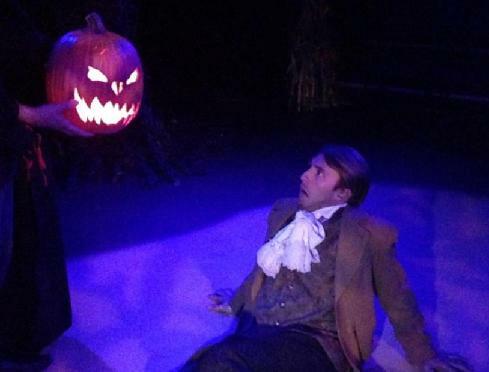 The Covey Center for the Arts' production of "The Legend of Sleepy Hollow" combines humor with horror to create a unique experience for audience members. Washington Irving's classic story, as dramatized by Kathryn Schultz Miller and directed by Jarom Brown, is perfect for getting into the Halloween spirit this season. 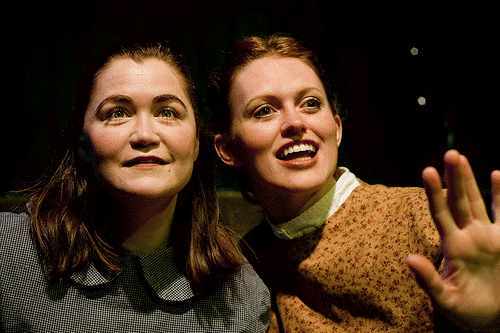 The play takes audiences back to Puritan New England where stories of witches, demons and ghosts haunt the town. The new school master of Sleepy Hollow, Ichabod Crane, finds himself in frightening predicaments as he navigates life, love, fear and the church bridge. The set was in a black-box theater and conveyed a creepy country town, but it was the lighting that changed the mood from a warm autumn afternoon to a dark night through the use of black-lights and warm amber lights. This setting was the perfect atmosphere for the actors to get into character and become the boys and girls of Sleepy Hollow. 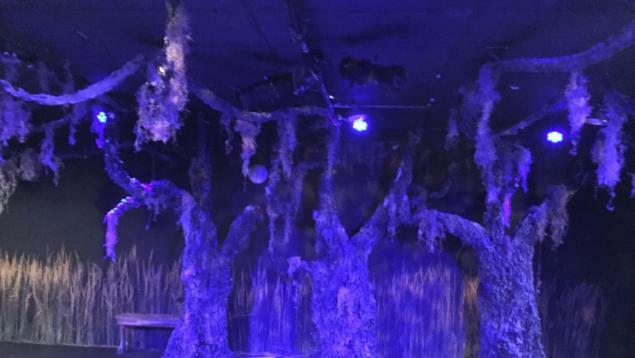 The set for The Legend of Sleepy Hollow at the Covey Center for the Arts. Before the opening-night performance of "The Legend of Sleepy Hollow" began, a storyteller told two stories to frighten the audience. Unfortunately, the stories felt out of place and detracted from the theme of the evening. The lack-luster opening was the only downside of this particular performance however. 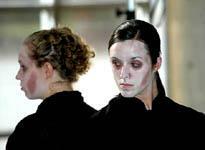 Funny character quirks and rhythm the actors embodied seemed natural, as did the seventeenth-century body movements. Shelley Boyd, the dramaturg for "The Legend of Sleepy Hollow," said that she helped the actors understand the proper etiquette of the time period. She said she worked with the actors on a variety of movements, including how to point and bow properly. 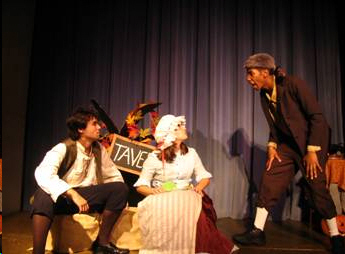 Tyler Fox, with his sharp movements and nervous demeanor, played an impeccable Ichabod Crane. Fox's performance was the highlight of the evening and his interactions with and reactions to the other actors were natural and hilarious. While the entire performance had some good scary moments, the most frightening was the appearance of the "Headless Horseman." The costume for the horseman was great, but the unknown actor inside was able to instill fear into the audience with the large pumpkin he held as his makeshift head. Douglas Bowen, who attended with his wife for their second anniversary, said the performance was "just the right mix of comedy, suspense and thrill." His wife Callie said it was funnier than she had expected. 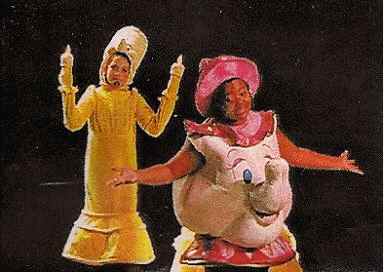 "Beauty and the Beast will illuminate you with a lesson and give you light and laughter!" Grades 5th & 6th Perform! of Beauty and the Beast ham it up for the camera. Forty-eight grade 5 and 6 École Deer Meadow School drama club students will be performing Beauty and the Beast as adapted by Kathryn Schultz Miller. The drama students have been preparing for their production since their auditions in September. The production will be hosted at the TransCanada Theatre at Olds High School on May 31 and June 1. Tickets will be sold at Ecole Deer Meadow School office for $10 each. The play begins at 7 p.m. each night, with doors opening at 6:30. The play is being directed by Dawnna Morgan and Jennifer Rabchak who are assisted by Olds High School students Russel Rabchak and Hailey Larson, who both have experience with acting and directing. Beauty will be performed by two actresses who will each have a public performance. They are Hannah Turnbull and Sophia Dodd. The Beast will be performed by Mannix Thorburn. This beloved story follows Beauty as she takes the place of her father at the Beast's castle to pay off his debt for stealing a rose. This unlikely love story involves music, dancing, mystery and comedy. "Beauty and the Beast will illuminate you with a lesson and give you light and laughter," says Ethan Giesbrecht (Grade 6) who plays Mr. Sparkle. 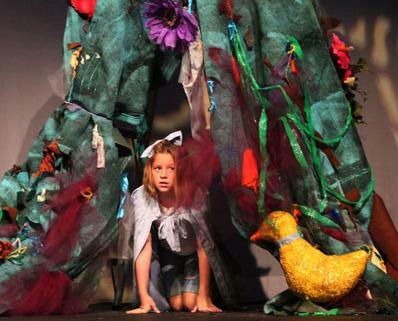 "We are hoping to collect 1,000 cranes from schoolchildren before the start of the play." 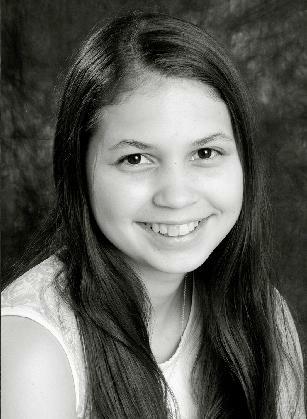 The College of Southern Maryland's Children's Theatre Company presents its cast for the production of "A Thousand Cranes," a drama by Kathryn Schultz Miller. Performances are at 7 p.m. on Oct. 10, and 2 p.m. and 7 p.m. on Oct. 11 at the Fine Arts (FA) Center on the La Plata Campus. CSM's cast includes Kaylin Beach of Pomfret as Sadako, Surasree Das of Olney as Kenji, Cory Bragg of Nanjemoy as Sadako's father, Emily Garcia of Waldorf as Sadako's mother and Alex LaClair of La Plata as puppeteer. Community members Sarah Infante, Ava Jones and Alayna Stewart round out the ensemble. 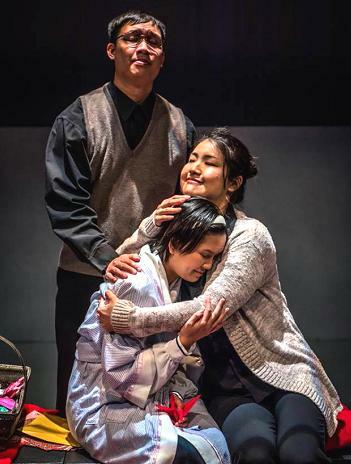 The play follows the story of Sadako Saski, a 2-year-old girl who lived in Hiroshima, Japan, with her family when the city was bombed during World War II. Ten years following the bombing, Sadako, is hospitalized, and it is discovered that she has "radiation sickness" or leukemia-an effect of the bombing that occurred a decade before. Kenji visits Sadako at the hospital and reminds her of an old legend about the crane. If a sick person folds a thousand origami cranes, the gods will grant her wish and make her healthy again. "The Community is Invited to donate origami cranes." 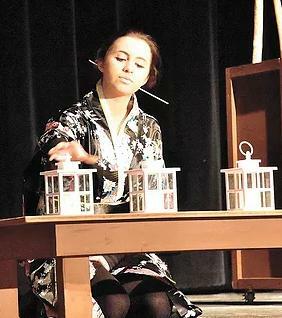 Kaylin Beach of Pomfret plays Sadako, a Japanese child with leukemia in the CSM Children's Theatre production of A Thousand Cranes. "We are hoping to collect 1,000 cranes from schoolchildren and organizations before the start of the play," said CSM Theater and Dance Coordinator, Associate Professor Keith Hight. 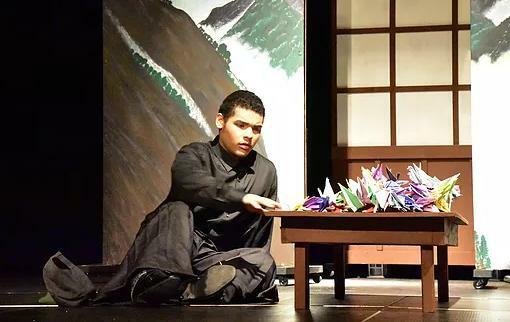 "We have received 300 expertly folded cranes from the Japanese Embassy in Washington, D.C. and are expecting students from Robert D. Stethem Educational Center in Pomfret and Hollywood Elementary School to bring cranes when they attend the Oct. 10 matinee. 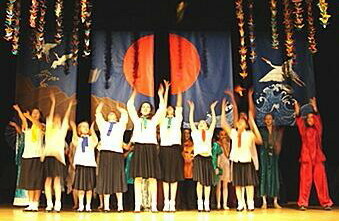 Following the performance, the origami cranes will be donated to Children's National Hospital." In addition, the Chin Hamaya Culture Center of Waldorf is supplying authentic kimonos for the production. The community is invited to create and donate folded origami cranes for the production. Instructions on folding the origami cranes can be found online at http://www.csmd.edu/Arts/children/index.html. A collection box for donated cranes is located outside the Box Office of the Fine Arts Center on the La Plata Campus. The Children's National Health System requests that all cranes that will be distributed to their patients must be made of new, clean materials and that those individuals making the cranes must wash their hands prior to doing so. For a promotional video for the play, visit http://youtu.be/xbd5K-AyeX4. 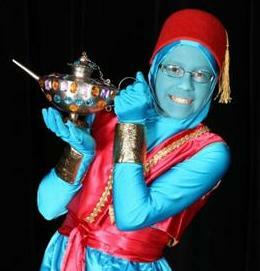 Performances are at 7 p.m. on Oct. 10, and 2 p.m. and 7 p.m. on Oct. 11. 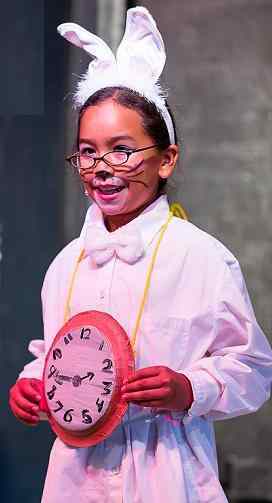 After only four weeks of education, Trinity Players Summer Youth Theater Workshop pulled off an excellent production at Trinity Alps Performing Arts Center in Weaverville. We are the Dream opened with the actors singing and walking down the stairs to the stage where paintings of posters of civil rights were hung at the back and risers where the cast were placed casually, yet quietly, unseen until actively participating in the scene. I had the opportunity to read the script a few months ago and it emotionally moved me, but made me wonder how non-blacks would pull it off. Well, I have to tell you that it didnt matter what the ethnic background of the actors were, they did pull it off royally. Bridget Rogers says in her directors notes, "We have come a long way since segregation, though we still have progress to make. We mustnt let it make us bitter, or have hate in our hearts. We must always love others. The dream continues to live in the hearts and souls of every person, young or old, male or female, who believes in freedom for all." Staff photo by Connor Cummiskey Tinker Bell (Sara Marquardt, left), Peter Pan (Dan Granberg, middle), and Peters Shadow (Noelle Boucher, right) ask the audience to blow air at the stage to make a wind for them to fly to Neverland. At 7:30 p.m. Friday and Saturday in the auditorium at MLC, guests can watch the MLC Childrens Theatre performance for $2 a ticket. I have an amazing cast and I appreciate all of the work they have done and I would love for everyone to come see it if they can, Director Alec Bergmann said. 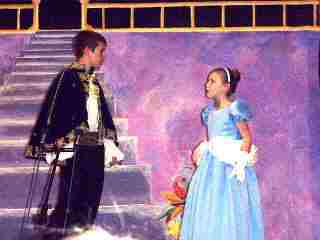 The show, written by Kathryn Schultz Miller, follows the classic story told in the Disney adaptation. 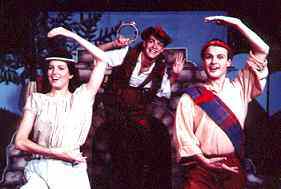 Peter Pan (Dan Granberg) takes Wendy (Alyssa Tessmer), Michael (Corey Paske) and John (Duke Backhaus) to Neverland so Wendy can mother the Lost Boys. Meanwhile, Captain Hook (Eric Dorn) single-mindedly pursues vengeance for his hand that Peter fed to the Crocodile (Noelle Boucher). The show has a few twists and turns that Bergmann said he would like to keep secret for now. 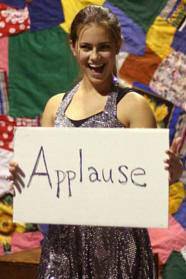 Though one major aspect is audience participation. We have a large variety of things for the audience to do all throughout the show, Bergmann said. From helping Peter find other characters to summoning a wind to help the children fly, the audience is almost as much of the show as the cast. The breakdown of the fourth wall begins as guests enter, where they will find the actors in character. We decorate the entire hallway for all the children to walk through and have fun with the characters before the show, Bergmann said. 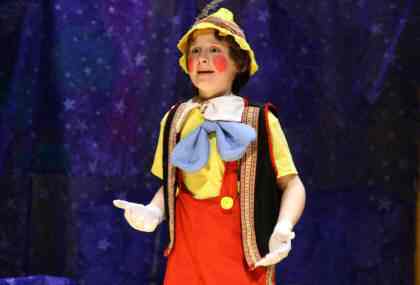 The evening performances follow hard upon two days of shows for students bused in from around the state, Bergmann said. 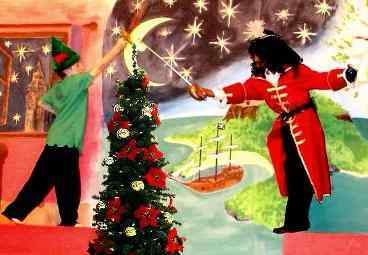 The actors perform three times a day Wednesday and again Thursday (not counting the public performance) to over 5,000 kids, Bergmann said. With this show, what is different about it from all other MLC shows is that we travel, Bergmann said. Each year the show alternates between two schools, thus the set is pretty minimalistic. That is also to encourage childrens imaginations, Bergmann said. 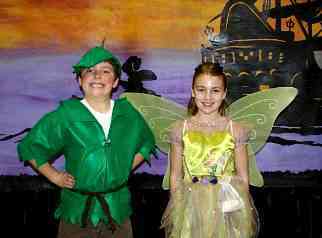 So put on some dancing shoes, sprinkle on some fairy dust and join MLC Childrens Theatre on their way to Neverland. 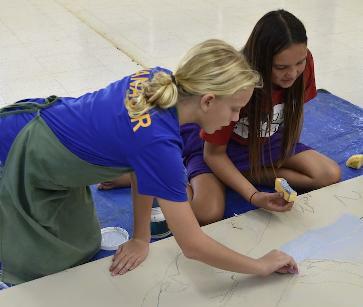 Fifth graders are preparing in earnest for their upcoming show, "The Legend of Mulan," by Kathryn Schultz Miller and directed by Peggy Ellenburg. 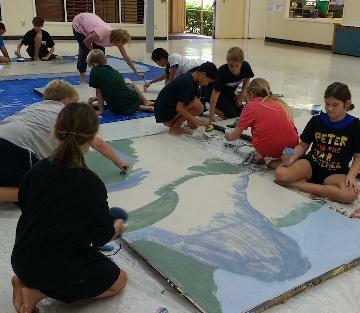 Yesterday, the class had a session on set painting led by former Island School parent and volunteer, Laurel McGraw. These photos capture them painting base colors on their backdrop flats. The finished product will be of a Chinese landscape. Parent volunteers have been assisting with set building and volunteer coordination. 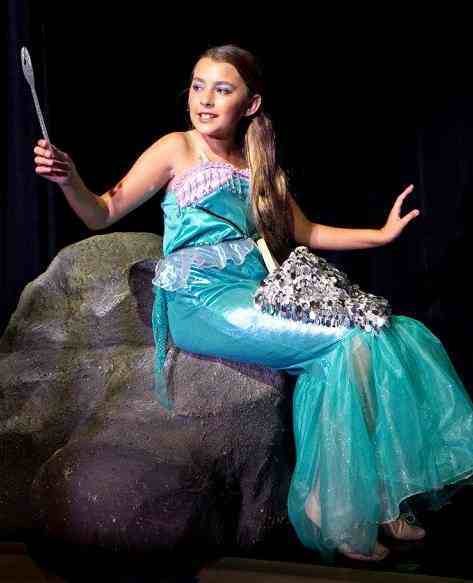 Anyone wishing to get involved with sets or costumes is encouraged to contact Peggy Ellenburg: 808-639-7963. 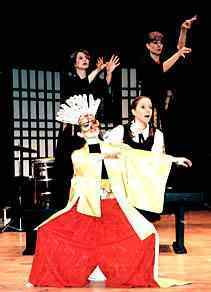 "The Legend of Mulan" will run the weekend of March 2-4 at the Island School theatre. 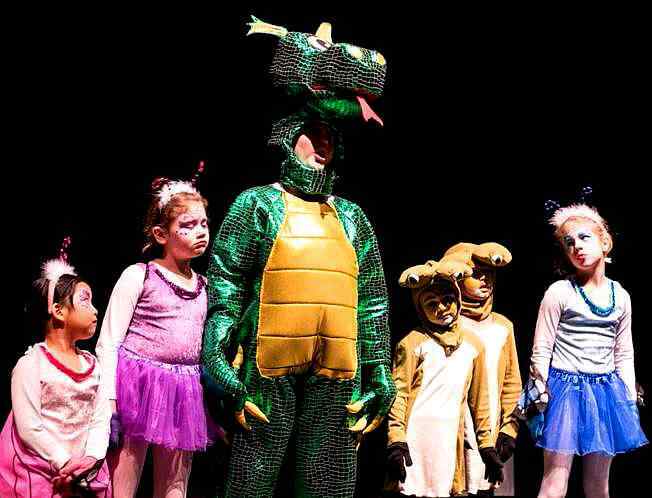 If you have children and you live in the Treasure Valley, you need to know about Treasure Valley Children's Theater (TVCT) and Treasure Valley Youth Theater (TVYT). These two programs were started by Autumn Kersey and they will keep the children in the valley entertained and entertaining. 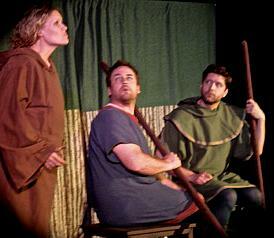 This production was ROBIN HOOD (an interactive play for young audiences by ArtReach's Kathryn Schultz Miller). 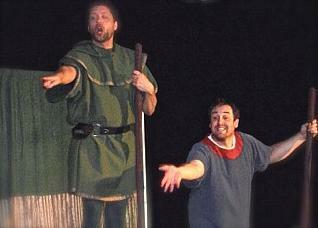 Many of the children polled in the audience had not seen or heard ROBIN HOOD, however, they all enjoyed the performance. The actors are professional how they present the children's play and a few of them are professional comedians in Poise (improve helps when you work with children). 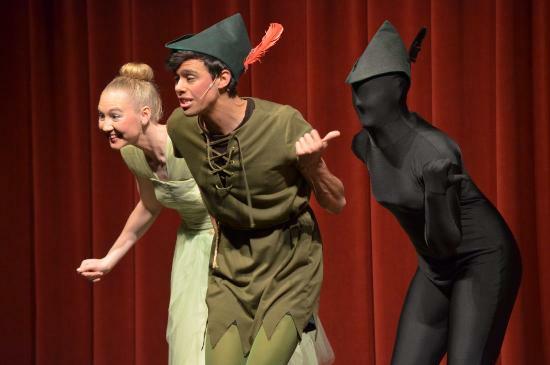 This story of ROBIN HOOD is told to us by three actors: Jordan Peterson, Jared Stull, and Nicole Stull (the Stulls are players with ComedySportz improve group, as well). 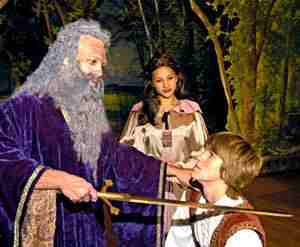 We are told of how King Richard has gone off to war and left Prince John to run the kingdom. Prince John is the kind of character toward who the audience "Boos". 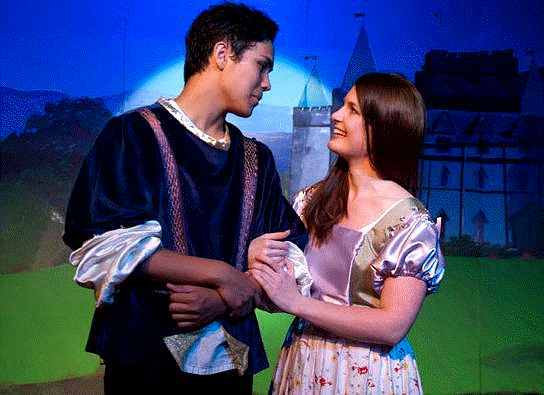 The prince wants to marry Mad Marian but she is in love with Robin Hood. The audience is told exciting tales of how Maid Marian and Robin Hood get together. 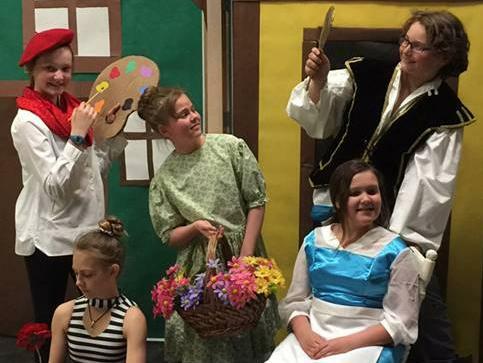 The Productions I have seen by Treasure Valley children's Theatre are great at getting the audience involved and keeping them there! Co produced by Decatur's Golden K (Kiwanis) and the Millikin School of Theatre and Dance, this year's Theatre for Children is "Blue Horses" by Kathryn Schultz Miller. On a summer evening four young people don't want to go home just yet. One invents a game of "wish upon a star" which demands that each friend tell a life story in which the others can take roles and help the central characters achieve their goals. One rides his intergalactic bicycle through the asteroid belt to a distant plant to discover and defend against hostile beings. Another wishes for his twin brother to help him solve the day-to-day problems of schoolwork. His wish is granted until he discovers his unique talents and chooses to be independent again. Finally, one who struggles to be normal in her family of artists find that vision improves when horses really can be blue. Each person's story helps him or understand and assist one another in the trials and tribulations of grow up, gaining self-confidence and making friends. 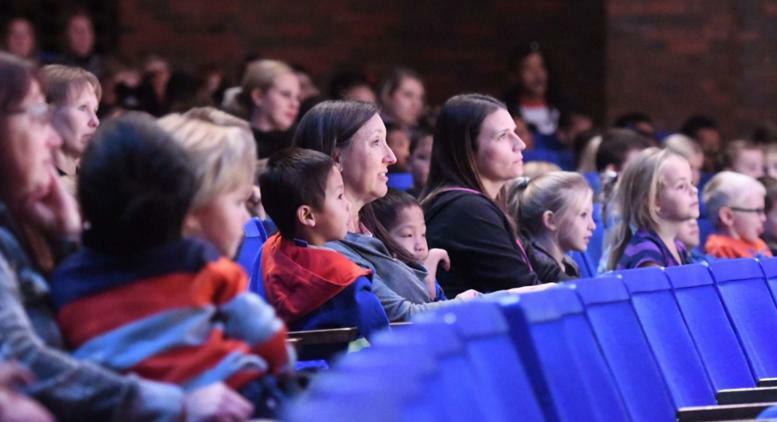 DECATUR -- Millikin University students enjoy a good childrens program as much as most children, especially when they get to do the pretending. Millikins School of Theatre and Dance will present two performances of the childrens play Blue Horses by Kathryn Schultz Miller at 1 p.m. on Saturday, Nov. 4, and Sunday, Nov. 5, in Millikin Universitys Kaeuper Hall in Perkinson Music Center. The story is about four children using their active imaginations and learning about themselves along the way. Their game Wish Upon a Star sends them on adventures, with their friends helping them through their trips. One rides his bike to other planets. Another dreams his has a twin. Still another simply wants to learn how to jump rope. Throughout the stories, the friends act out the adventures with help from each other. Each child discovers self confidence and gains new friends. 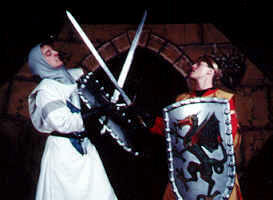 The play was created to entertain children. However, Millikin students appreciate a good story too. As a Millikin director, Denise Myers provides the students learning opportunities through various acting disciplines. 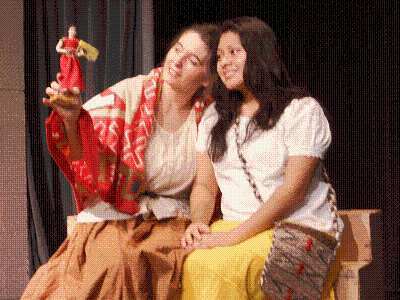 According to Myers, Millikin has presented an annual childrens play for 25 years. 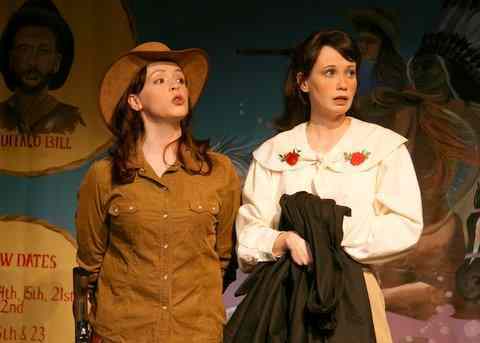 The shows are produced by Millikin as well as the School of Theatre and Dance. Other civic groups, such as the Optimist Club, have co-produced throughout the years. For nearly 10 years, the Golden K Kiwanis of Decatur has helped support the plays. The organizations mission is to help children through various opportunities of volunteering and fundraising. 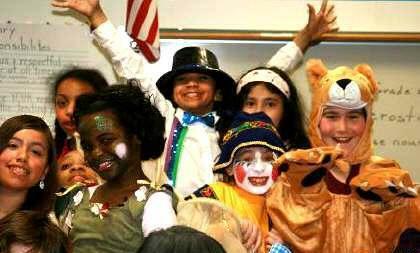 Myers is grateful for their partnership in creating the childrens plays. The Hinckley-Finlayson drama department will be performing 'A Thousand Cranes' this Saturday at the sub-section competition in Pine City. The play is by Kathryn Schultz Miller and is based on the true story of Sadako Sasaki who survived the atomic bomb on Hiroshima in WWII. Participating schools include Hinckley-Finlayson, East Central, Pine City, Rush City and Brraham. H-F is scheduled to perform at 9 a.m.
More than 125 years after it was written, Treasure Island still captures imaginations with its wild tale of searching for buried treasure, running off to sea, fighting evil pirates, actually finding the treasure and finally, returning home to live happily ever after. Robert Louis Stevenson wrote his adventure novel in the early 1880s, with the express purpose of entertaining youngsters yearning for excitement. Besides becoming a classic in book form, the story has been made into movies several times, as well as adapted as plays, including one that appeared on Broadway for more than 200 performances in 1915. 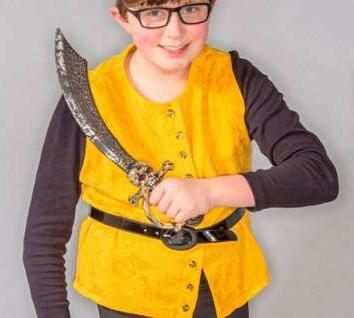 This time, though, its the Rose Childrens Theatres turn to take Treasure Island to the stage, which they will do for four performances on Feb. 16-18. Their story is a bit different from the usual. 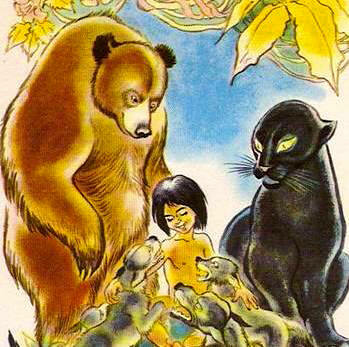 In their version, young Jim Hawkins has a very bad day, dreams of becoming a pirate, meets up with Billy Bones and Long John Silver and has his own pirate-and-treasure adventure. 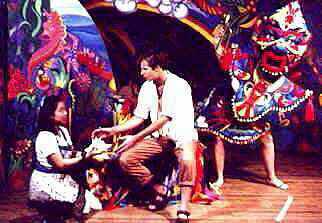 Also unlike Stevensons story, the Rose Childrens Theatre play also incorporates an expanded number of colorful characters such as mermaids, dancing crabs and a bevy of very talkative parrots. 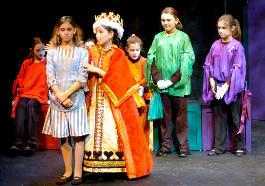 The cast includes 51 actors in third through tenth grades, directed by Judy Wenger and Rebekah Hope. 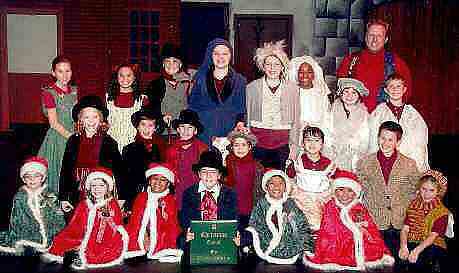 The script was adapted by Kathryn Schultz Miller of ArtReach Childrens Theatre Plays. 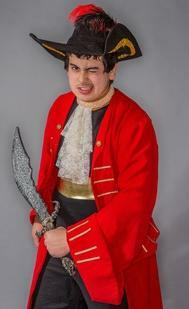 Featured actors are Jack Perini as Jim Hawkins, Isaac Lonergan as Long John Silver and Elias Santin as Ben Gunn, with Enzo Valdez playing Captain Smollett, Clara Christensen as Squire Trelawney, Henry Davis Piger as Dr. Livesay and Ellie Williams as the pirate known as Blind Pew and Hugh Brinkley as Billy Bones, another pirate. Additional pirates are played by Natalie Stern, Casey Beasley-Bennett, Maren Nixon, Raiden Kautzman, Flynn Miller, Sydney Sattler, Addison Sattler and Noah Wagner. The cast also includes mermaids Bella Morgan, Vera Lichvarcik, Alana Strand, Peyton Anderson, Sofia Kovash; crabs Nate Rosenfeld, Kevin McCoy, Ethan Park, Tristan Riplinger and August Santin; parrots Gage Wagner, Siena Buchanan, Peter Christensen, Eli Turanski and Greenley Robinson. Sarah Pearson plays the mother, and storytellers include Avery Puhn, Owen Colley, Ben Carson, Ruby McKrola-Dey, Vivien Tritch, Jani von Ammon, Gus Nelson and Caroline Robinson. Ruby McPherson and Anna Pierce are teachers, and the inhabitants of Skeleton Island are played by Natasha Dracobly, Kaitlyn Pintens, Piper Kyle, Kennedy Powell, Meridian Hula, Dora Boos, Ellie Park, June Robinson and Elena Morris. 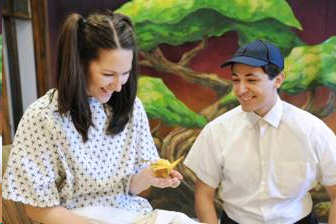 Wild Swan Theater will present A Thousand Cranes as part of its 38th season of bringing high quality professional theater to young audiences in southeast Michigan. Wild Swan is very proud to be bringing A Thousand Cranes back to the stage. This very beautiful and moving play tells the true story of a young Japanese girl's experience after the bombing of Hiroshima. 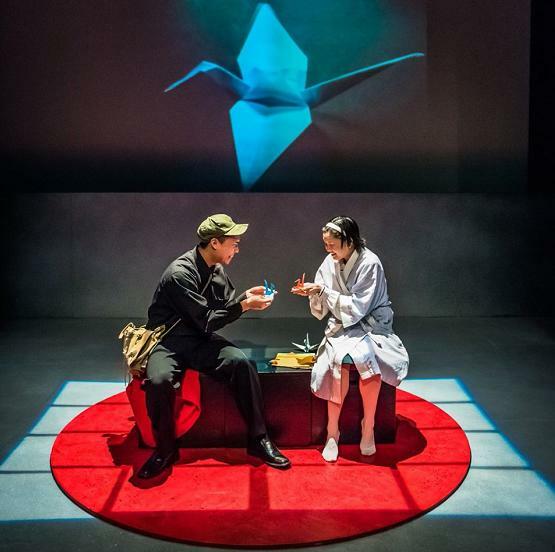 The play recounts Sadako's illness from radiation poisoning and how her friend Kenji teaches her to fold paper cranes as a way of getting well. 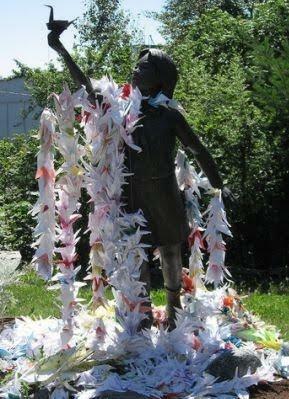 Sadako's story became a catalyst for children from all over Japan to begin to fold paper cranes in her memory. Now there is a monument to Sadako at the Hiroshima Peace Park in Japan and people from all over the world bring garlands of cranes to it. As the play begins, Sadako (Monica Mingo) is practicing for a race with her best friend Kenji (Jeremy Salvatori). Without warning, she suddenly falls ill and is hospitalized. As her parents (Jeff Miller and Elaine Riedel) try to keep up her spirits, she begins to fold paper cranes, having learned from Kenji that if she folds a thousand, the spirits will grant her a wish. As her condition worsens, she is visited in a dream by her grandmother (Slavka Jelinkova) who takes her to the spirit world. 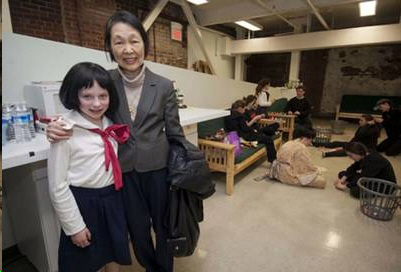 There she meets and learns the stories of many people who were killed when the atomic bomb fell. As she joins her grandmother in the spirit world, Sadako changes her wish from getting well to hoping for peace in the world. 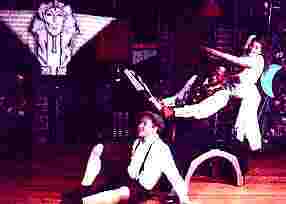 The style of the production is very theatrical with music and masks playing very important roles. University of Michigan Professor of Music Erik Santos has written the haunting score for the production, and the music is integrated completely into the production. An array of unusual percussion instruments underscores the flute (played by Lisa Warren) and creates many of the sound effects. All the cast members join the percussionist to play such instruments as drums, bells, glass bowls, a rain stick, and a marimba when they are not acting in a particular scene. Seven austerely beautiful red and white masks, created by costumer John Gutoskey, help shift the scene, first to the hospital and then to the world of the spirits. 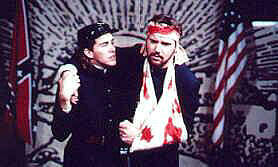 Actors Don White masks as they create the hospital scenes. The red masks are worn by actors as they create the world of the spirits. 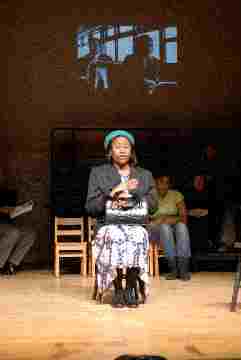 As is customary in Wild Swan productions, American Sign Language Interpreters take an active part in the production. 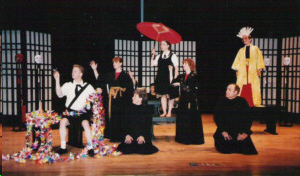 In this production, Marin Goldberg and Erin Parrish are dressed as the rest of the cast in flowing black Japanese robes. As well as interpreting all the spoken lines of dialogue, they also join other cast members as doctors and spirits and dance with the grandmother and Sadako. Today there is a monument to Sadako in the Hiroshima Peace Memorial Park, and garlands of cranes are hung there from all over the world. As in past performances of this play by Wild Swan, attending families are invited to bring paper cranes to the theater or make them after attending the A Thousand Cranes. Origami paper and instruction will be provided after each performance so that those audience members can make their own folded paper crane with their own message of peace. All the cranes will be displayed in the theater during the run of the production and will be sent to the Children's Peace Monument in Japan afterwards. 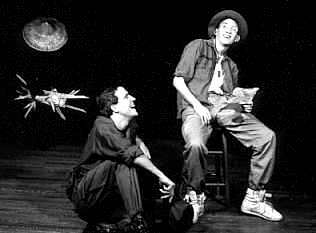 If you have visited Hiroshima, you might have seen cranes folded by children from throughout southeast Michigan, transported to the monument after one of Wild Swan's earlier productions of the play in 1994, 1998, and 2005. 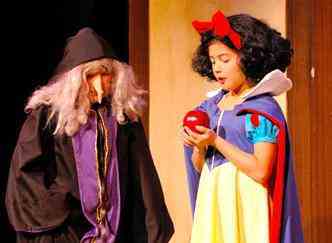 This production is recommended for children in grades 3 - 12. This production is supported in part by the Ford Motor Company Fund, James A. and Faith Knight Foundation, Michigan Council for Arts and Cultural Affairs, Michigan Humanities Council, National Endowment for the Humanities, and the National Endowment for the Arts. Wild Swan Theater is dedicated to making professional theater of the highest artistic quality for young people and families that is accessible, diverse and inclusive, through affordable ticket prices and innovative outreach programs. 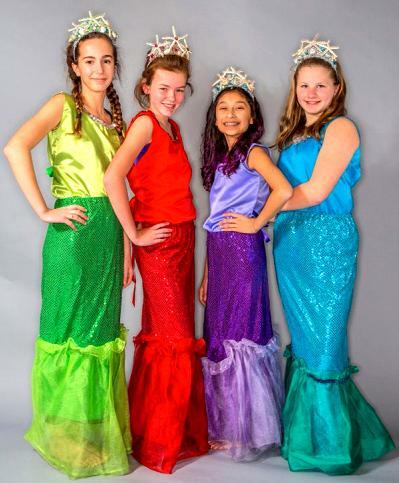 For more information about the company, its current season, touring programs, drama classes and camps, visit the Wild Swan website at wildswantheater.org. For interviews, contact Michelle Trame Lanzi at (734) 995-0530. Since its inception 19 years ago, SecondStory Repertory (SSR) has offered both a mainstage season and a season of Theater for Young Audiences every year. 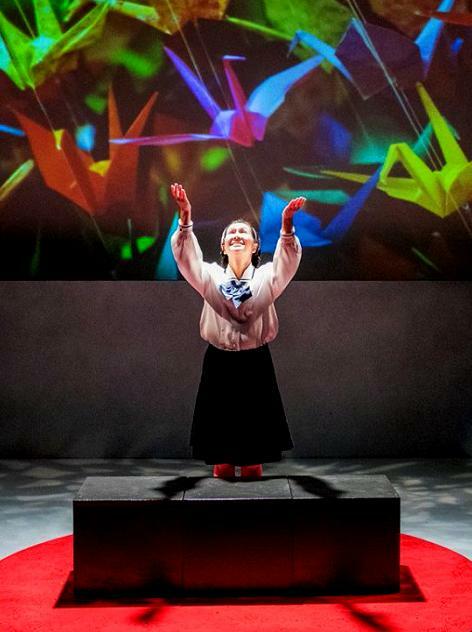 This season, Kathryn Schultz Millers play, A Thousand Cranes, which tells the story of young Hiroshima resident Sadako Sasakis pursuit of peace following the dropping of the atomic bomb, will be featured during weekend matinees for children for four weeks. 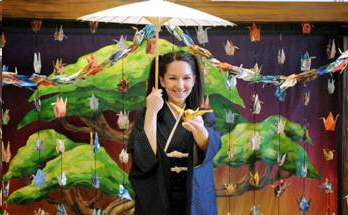 A Thousand Cranes runs from Jan.13 to Feb. 3 at SecondStory Repertory, 7325  166th Avenue NE, Suite F250, Redmond. The true and poignant story of Sadako Sasaki, who was 2 years old when the atomic bomb was dropped on the small city of Hiroshima, where she lived. The star of her school's running team, Sadako is lively and athletic ... until the dizzy spells start. Then she must face the hardest race of her life - the race against time. 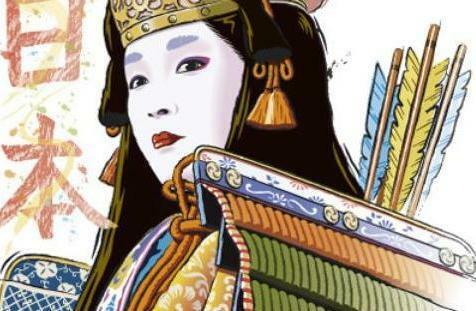 A Thousand Cranes celebrates the courage that makes one young woman a heroine in Japan. 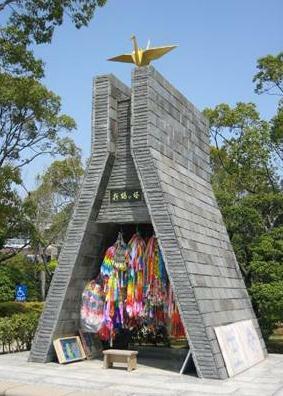 The Hiroshima Peace Memorial, completed in 1958, has a statue of Sadako holding a golden crane. At the base is a plaque that says: "This is our cry, this is our prayer: peace in the world." THEATRE WINTER HAVEN: SHAKESPEARE TO GO! An ensemble of teens performing for their peers at local middle and high schools! 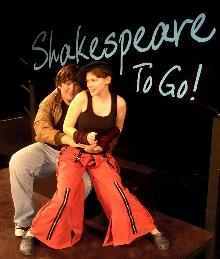 PUBLIC PERFORMANCE: SHAKESPEARE TO GO! Please stop by the Box Office to purchase your tickets! 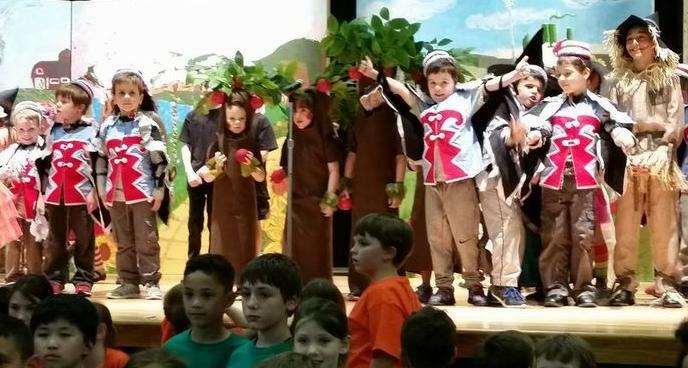 The Widener Childrens Theatre Workshop (CTW) performed The Legend of Sleepy Hollow, the famed ghost story originally penned by Washington Irving, on November 3, 4, and 6. Unlike Washington Irvings or Tim Burtons version of the story, this was specifically written for a younger audience. The story still follows the same basic plot: a middle-aged school teacher named Ichabod Crane (Brian Harrington) comes to the town of Sleepy Hollow to take a job as the new school teacher. Ichabod falls for the young Katrina Van Tassel (Kara Gilbert), a woman whom Brom Bones (Jon Owens) has already spoken for. Brom wastes no time in telling Ichabod of the Headless Horseman (Dan Cronin), the ghost who haunts the bridge in the town. This version deviates the most from the others in the plays climax when Ichabod meets his demise at the hands of the Headless Horseman. 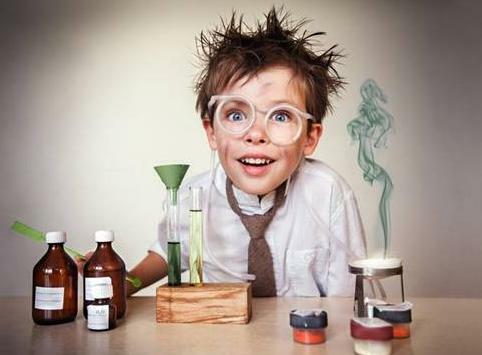 Unlike other adaptations, CTWs production contains more comic relief and less scares. 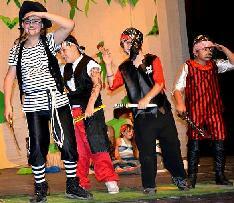 The play, however, was meant specifically for children and in that regard was a success. 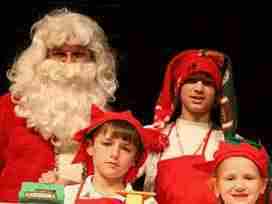 The children in the audience were very receptive, both during and after the show. 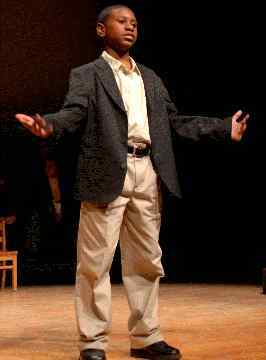 "I would ask rhetorical questions and they would answer, Harrington said of his performance. "Theyre a lot more receptive. Cronin offered a similar sentiment. "With adult theater, people are more subdued. What makes it special for [children] is knowing it played for them. During the show, many of the children offered more audible cues than simply laughter or screaming. If there was a plot point, for example, that a child didnt understand, he would express that aloud. As a 20-year-old writer, its difficult to put myself in the mindset of a child and enjoy it in that manner. 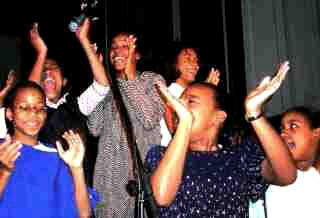 However, I agree with the performers that the children in attendance found it extremely enjoyable. As a college student, I didnt find the conclusion frightening, but if I were in grade school, I probably would have. 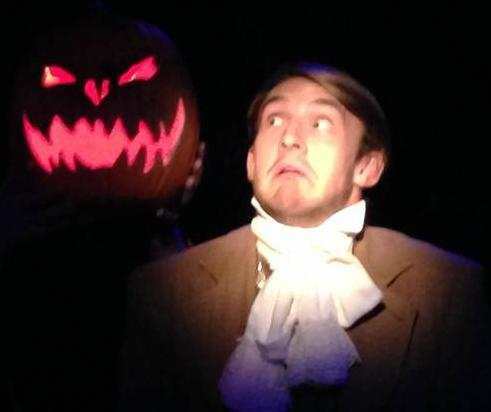 During the shows confrontation between Ichabod and the Horseman, the audience reacted the most, both with laughter and screams. Unlike traditional theater, this production took full advantage of the building in which it was being performed. 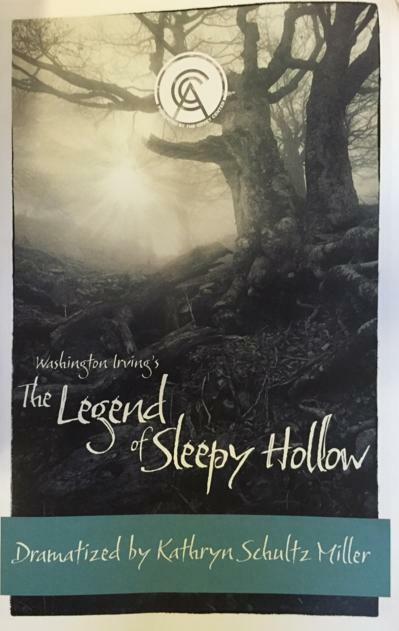 Most theater creates a separation between the audience and the performers; The Legend of Sleepy Hollow instead tried to build a gap between the two. 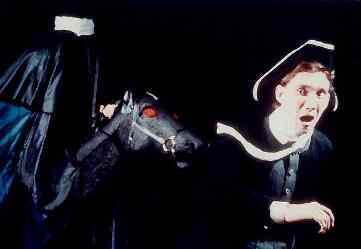 During the climax, Ichabod is chased by the Horseman not just on the stage, but through the isles and the seats, which allowed the audience to react even more strongly. To further solidify the union between the performers and the audience, after the performance the cast took questions from the audience. 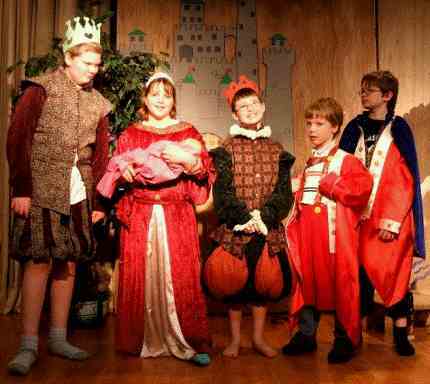 To be sure, the response I got from the cast was that it was equally as fun for them as it was for the children. "I got a real kick out of making six hundred kids scream, said a smiling Cronin. 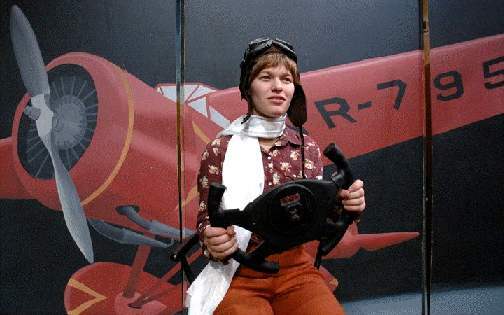 Lisa Eckley Cocchiarale, the director of the play, described it as being an intelligent play made specifically for kids. If the reactions of the children were any indication, the play was a success. Piedmont Players Theatres "A Thousand Cranes is the story of a young girl growing up in the shadow of Hiroshima. But to the young cast members, its become much more than that. Theyve had the opportunity to meet Yoshiko Otey, who survived the bombing of Hiroshima. And in between shows for the countys fourth-graders this week at the Norvell Theatre, they were folding 1,000 cranes for her. When Otey was diagnosed with lymphoma a few years ago, their daughter sent her a box of tiny cranes. It meant more to Otey than any words her daughter couldve said. The cast decided to do the same to wish her well. 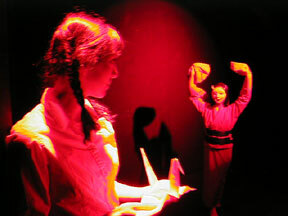 In the play, the girl, Sadako, becomes ill 10 years after the bombing of Hiroshima. She wanted to fold 1,000 cranes, based on the legend that doing so would restore her to health. She only made 644 before her death, but her classmates finished for her, making an additional 356 cranes. Today, a statue in her honor can be found in Hiroshima  a cry for peace from children. 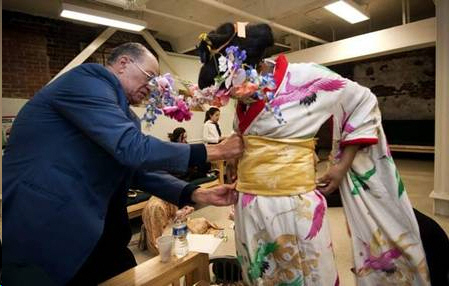 JON C. LAKEY / SALISBURY POST: Fleming Otey helps Vivien Rudisell with her costume. At 9 a.m., theyd performed for a house full of students, all sitting in hushed excitement, eager to see the 30-minute, one-act play. Their admission ticket? A folded crane. You never know exactly where a show will go, Leonard noted. 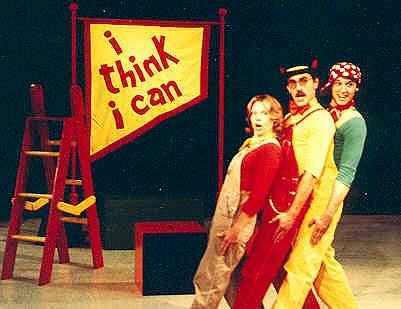 "You just launch it and hope. Each cast member dropped a completed crane into his or her own small, plastic laundry basket. The Oteys stood nearby, looking on with gentle smiles. Pastor Otey has seen the play more than once. "Its just as strong each time, he said. Seeing the play for Yoshiko Otey has been emotional but healing, she said. "Its been such a long time. Its like waking up from a dream. Following treatment, Otey is doing well. When Kenji visits the ailing Sadako by her bedside he offers her a folded crane as a gift and explains why. Japanese legend has it that if a sick person makes a thousand paper cranes then the gods will grant her wish of health again. Inspired by Kenjis story, Sadako attempts to reach that number. Told in just under forty-five minutes with no intermission, director Dwayne Hartfords production presents its story with grace, poise and theatrical precision. Holly Windingstands wonderful looking scenic design is based on Noh, a form of historical Japanese theatre which originates back as early as the fourteenth century. Here we have a raised floor backed by the traditional painted design of a pine tree all under a raised roof. Stage right stands a sound station where actors produce sound effects and play drums throughout, highlighting moments of action and movement and underlining the drama. Its amazing that in such a short amount of time, some important themes, issues and traditions are explored in a manner that cant help but inspire young minds to want to learn more. In addition to the more obvious themes of war, the atomic bomb and radiation, there are also examples of respect for traditions, discipline at home, love of family and pin of eventual loss, not to mention that many, A Thousand Cranes may even be a childs initial introduction to the fun of origami. 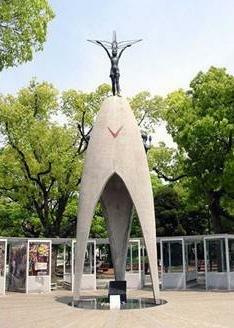 Today a statue of Sadako stands in Japans Hiroshima Peace Park. Once a year theres a holiday called Obon Day. This is where the country remembers the spirits of ancestors and close family members who have passed on. Each year, on Obon Day, Japan plays tribute to the young girl and other children who died from the radiation effects of the bomb by leaving thousands of paper cranes by the statue. Childsplays A Thousand cranes shows why. "This is Our Cry - This is Our Prayer..."
Following the play, audiences are treated to both an Origami family activity plus a brief Q&A session with the cast. This not only gives audiences a chance to ask questions regarding Sadako but also about theatre in general. At the performance this reviewer attended a child asked Michelle a question regarding D. Daniel Hollingsheads eye catching costume designs, particularly Sadakos kimono. Michelle mentioned how long it would normally take someone from Japan to properly attire themselves of such a complicated outfit, then proceeded to unsnap Hollingheads clever all-in-one design illustrating how performers can effectively change costumes in an instant. If excited comments overheard in the lobby after the show are anything to go by, this single simple moment of theatrical reveal was just as inspiring to some as the play itself. Thank about it. How priceless is that? 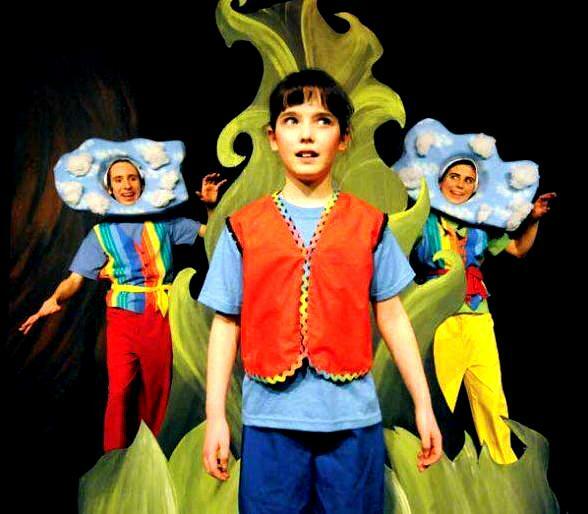 Did you know that Childrens Theatre has its own worldwide advocacy origination? 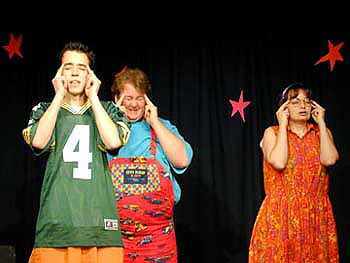 Its called ASSITEJ which stands for International Association of Theatre for Children and Young People. They sponsor a global event entitled The World Day of Theatre for Children and young people, an ASSITEJ campaign, promoted and celebrated through the message Take a Child to the Theatre Today. At Christmas-time a few grave words are not quite out of place, I hope, even at the end of a book of nonsense - and I want to take this opportunity of thanking the thousands of children who have read Alice's Adventures in Wonderland, for the kindly interest they have taken in my little dream-child. The thought of the many English firesides where happy faces have smiled her a welcome, and of the many English children to whom she has brought an hour of (I trust) innocent amusement, is one of the brightest and pleasantest thoughts of my life. I have a host of young friends already, whose names and faces I know - but I cannot help feeling as if, through "Alice's Adventures" I had made friends with many other dear children, whose faces I shall never see. 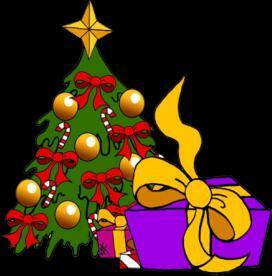 To all my little friends, known and unknown, I wish with all my heart, "A Merry Christmas and a Happy New Year". May God bless you, dear children, and make each Christmas-tide, as it comes round to you, more bright and beautiful than the last - bright with the presence of that unseen Friend, who once on earth blessed little children - and beautiful with memories of a loving life, which has sought and found the truest kind of happiness, the only kind that is really worth the having, the happiness of making others happy too!